Some people call it “frosé.” Other people call it “frozen wine.” I call it “Mommy’s Super Juice.” Peach Wine Slushies, welcome to the party. And boy, am I ever glad to see you. Summer is a time for relaxation and rejuvenation. It’s also a time for travel. And if you’d asked me a year ago how I felt about travel, I would have replied with some seemingly chipper form of “Love it!” or “Can’t live without it!” But add a 10-month-old baby to the equation, and surprise, surprise, I have a whole new outlook on planes, trains and automobiles. I am fresh off of a 12-hour travel day with our bouncing baby boy, who also happens to be a teething, rolling, babbling, maneuvering 25-pound ball of deliciousness (that I can’t imagine life without). But can I be honest? Traveling with children under the age of 5 should either (A). be an Olympic sport so you at least get a medal if you do a good job or (B). be illegal. After yesterday’s trip back from Hilton Head, South Carolina, I am convinced we may never be leaving our living room again. There was a 4 a.m. wakeup time. There was a 3-hour layover. There was an angry fellow passenger who hated anyone under the age of 149. There was an airplane bathroom changing table the size of a Snickers bar (fun size, not regular). There was no sleeping by said bouncing baby boy. And you better believe it when I tell you there. were. tears. He cried. I cried. We all cried. What is the answer to the madness? I don’t even know if there is an answer, but if you have one, PLEASE share with us below. How do you make travel with children manageable? I am all ears. 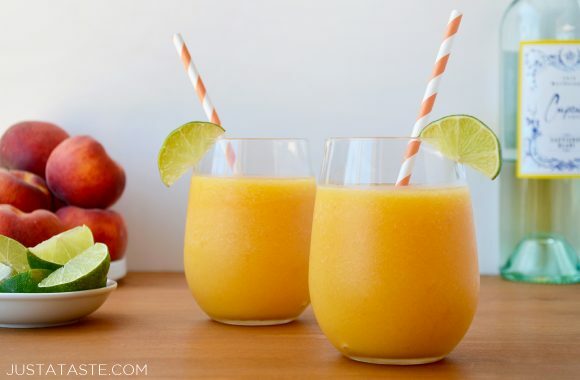 And while I’m listening, I’ll be sipping on gin and juice Peach Wine Slushies. Mix. Blend. Pour. Devour. Repeat. 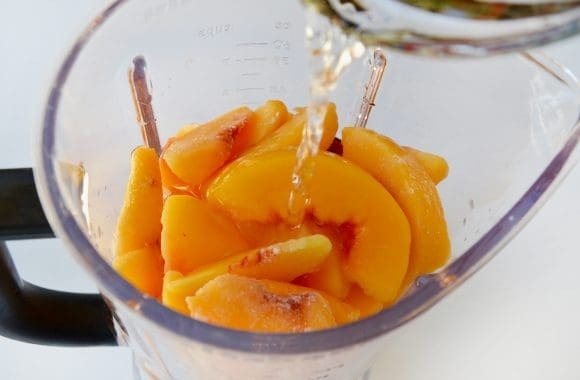 Add the frozen peaches and wine to a blender. 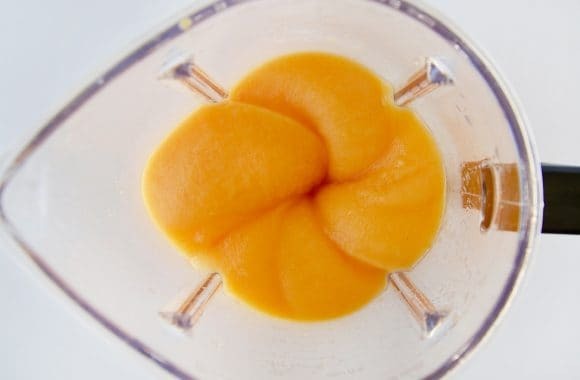 Blend until the mixture is puréed. 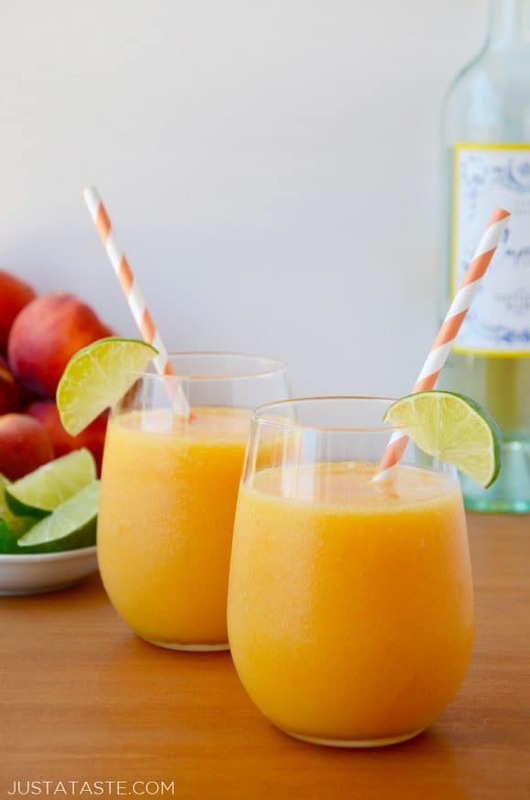 Pour the slushies into glasses, garnish with fresh peaches and serve immediately. Use any variety of white or rosé wine. 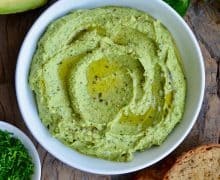 My favorite is a light and crisp pinot grigio, but chardonnay or sauvignon blanc will also work well. For thicker slushies, reduce the wine to 1 1/2 cups.